There’s a lot to love in this debut novel from Carol Moreira. I’ve been a massive fan of the Multiverse idea since Philip Pullman did it so well in the His Dark Materials trilogy. Moreira explores the idea of multiple universes, whilst also drawing in the idea of there being multiple version of the same person, like the whole ‘every time I make a decision, a new universe is created in which I made the other choice’ idea. Cleverly, she combines it with teenage insecurity – Tanya’s double, P, is the better, cooler, stronger version of Tanya. We all know as readers that Tanya has it in her to become as good as P, and therefore the journey of the novel should be an exciting one.There was a lot of imagination on display, with the different universes and the idea of invaders from a ruined universe trying to come through into a different one. The different way that P and the others from her universe talked was a but jarring, but otherwise a clever way of adding a layer of distinction between the two ‘similar but different’ sets of places and characters without making the reader work too hard to keep track.I also really loved the idea of mind invasion – what a creepy and frightening method of taking control: exerting authority over a weaker mind and erasing that person to use their body for your own nefarious ends. From the physical danger of the invaders pressing against the membrane of P’s universe, to Tanya’s own private mental battle, there was a lot of menace throughout the story.There were some things that I felt fell a little flat – characters and concepts are introduced thick and fast, not always leaving the reader enough time to get the hang of things. By the end of the novel, there were three different universes, Tempists, Fabricists, Resist members and other groups, none of which I felt were explored sufficiently. I really just wanted it to be longer – for Moreira to take more time over showing us these worlds that she had clearly imagined so vividly. As it stood, there was just enough to carry me through without getting lost, but not enough for me to truly connect with the people and places.I’m not sure, judging from the end, whether this is intended to be the first in a series, or a standalone volume. Certainly, it could be either. In a way, I hope that there is a sequel, as there was so much going on – even now as I’m typing, I’m remembering other themes and ideas that were brought up throughout the novel – I’d like to see Moreira take one or two of those ideas and really give them close attention and focus.Overall, then, an enjoyable read, but not without some minor frustrations. Engaging ideas and, to a certain extent, engaging characters – particularly Tanya – but other elements were too quickly introduced to really connect with deeply. 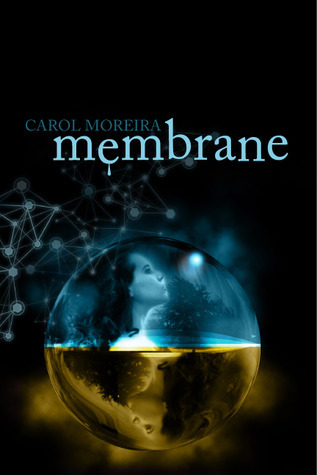 Originally posted at Escape Through the Pages with the same rating.MEMBRANE by Carol Moreira is a whirlwind of a sci-fi ride through alternate universes and (not-so) alien invasions. Tanya is a fairly normal high school student until she finds herself sucked through the Membrane into an alternate universe where she meets her alternate self. Crazyness ensues!It’s always fun to read books that take place where you live, since you get to recognize street names, places and events. So like Tanya, when she finds herself through the Membrane into a parallel Nova Scotia, I too was struck by the differences. Tanya has had a rough time of high school and the alternate universe experience doesn’t help her any. Tanya is kind, sensitive, a little anxious and depressed, but has a good head on her shoulders and ultimately really cares for others. She’s a quick thinker and helps get herself, her double (called P for Princess, and boy is she) and others out of sticky situations. P on the other hand, is quite opposite of Tanya. She’s very sure of herself to the point of arrogance at times, and while she can be cruel she is kind at heart.I really enjoyed the descriptions of the alternate universes (Tanya visits two) and the Membrane that separates them. Tanya finds herself wrapped up in quite the mystery where an invasion may not be an invasion, and another may be going on behind the scenes. There is a wonderful “bad guy” who you can tell has secrets and agendas galore. While Tanya and P come from very close universes, the Others that are invading P’s world are quite different. I could have done without the numerous references to how beautiful they are, but other than that they were fascinating and the source of much of the worry and fear felt by P and Tanya.I’m a huge sci-fi fan, and quite enjoyed MEMBRANE by Carol Moreira. While I found a few parts of the narrative a little jumpy and confusing at times (I’m still not exactly sure who the Fabricists are) the major plot points, resolutions and set up for a sequel (maybe? It’s certainly left open for one!) were all wrapped together rather well by the end of the book. Tanya had some good growth throughout the story, as did P through her interactions with Tanya and some world-shattering truths. MEMBRANE is engaging and unique, and I would be happy to recommend it to young adult sci-fi readers (and not-so young adult ones). Carol Moreira’s “Membrane”Recently I began an internship at Fierce Ink Press, an publishing company based in Atlantic Canada which focuses on young adult fiction. As part of this experience, I attended the launch of Carol Moreira’s Membrane. Carol read an excerpt of her book during the launch and I was immediately hooked. I was excited to dive right in to my copy of her book. After much anticipation, I started reading last night and it was so enthralling I finished it this morning (I did sleep a few hours).The story follows the journey of Tanya Fisher, or TOT, as she travels between universes and learns how to be confident in her own skin. She faces some very serious obstacles and conquers them but what I liked was that she didn’t, and couldn’t, conquer them alone or without loads of very human emotions. TOT felt real to me–I could understand and empathize with her insecurities. The plot was intricate and I was blown away at how it never felt confused or rushed.Normally, I prefer for stories to end happily and all sewn up, and, while Membrane didn’t end unhappily, it certainly wasn’t all sewn up. However, in this case, that was perfect. The main character is a teenager who still has lots of things to figure out, new things to experience, and self confidence to build; it wouldn’t have made sense for it to end with all the loose ends tucked in. I am happy to think TOT will go on developing and building her life to be just the way she wants. This was a suspenseful book, full of believable characters with emotional crises that seemed real even when their surroundings were other-worldly. Membrane's strength is its concept: that there are parallel universes with other versions of ourselves and everyone we know living there. When the main character, Tanya, meets another version of herself who is slimmer and more confident, the reader can sympathize with her feelings of dissatisfaction with herself. The best part about this book, for me, was watching Tanya gain strength and value her strong sense of empathy with characters in her own and other universes. The fantastical elements, such as human-sized chickens, were just curious enough as to be imaginable, while the themes of perseverance and acceptance across the space continuum rang true. As with Carol Moreira's other book, Charged, the teens are appropriately a mixture of gutsy, self-involved, bold and insecure (as teens are). This book has an exciting plot, lots of tension, great characters, well-described settings, and fight-to-survive imperative. I enjoyed and recommend it. I am currently reading "Membrane" aloud to my grade 8 ELA students and they are loving it! I knew when I originally read it that it would be a great choice for young adults. The main character of Tanya is well-developed and my students already identify with her. The science fiction aspect of the book fits in perfectly with the current trend of popular books like "The Hunger Games" and "The Maze Runner." I recommend this book be placed in every middle and high school library. I was fairly disappointed in this story. It started out with a fascinating premise but it was not explored in the technical sense that I would expect in a work that is dubbed science fiction. Rather it was more of a fantasy similar to "Through the Looking Glass." I thought the main character was a bit inconsistent and the story as a whole lacked credibility. No matter how fantastic an idea may be, it should be written such that it becomes believable and this one never quite got there.